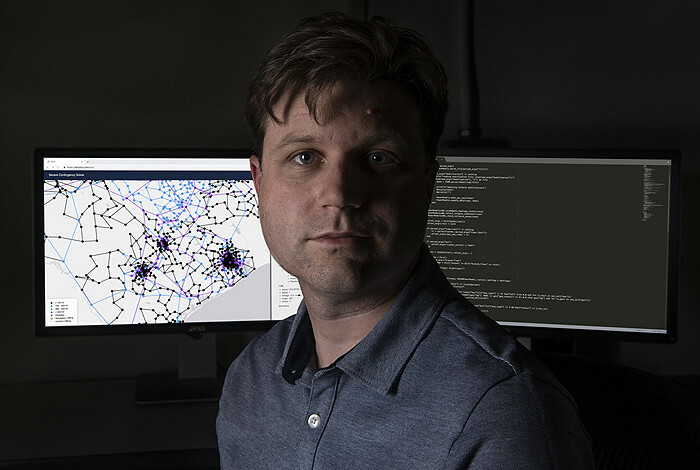 Carleton Coffrin, a computer scientist at Los Alamos National Laboratory, developed the Severe Contingency Solver software to help government agencies better plan for power outages caused by extreme events. The software is now available publicly. LOS ALAMOS, N.M., April 9, 2019 — A new, free, open-source software reliably predicts how damage from hurricanes, ice storms, earthquakes, and other extreme events will restrict power delivery from utility grids. The Severe Contingency Solver for Electric Power Transmission is the only software available—commercially or open-source—that reliably supports analysis of extreme events that cause widespread damage.